All Stuart Press books are A5 size unless otherwise stated and may be ordered by post from the address above. Please enclose an A5 stamped addressed envelope and payment (cheques payable to HMA Ltd). 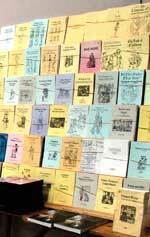 The company also stocks selected works by other specialist publishers, especially those written by the company's staff. These are labelled and may be subject to price changes beyond our control. Living History: These publications are designed to provide practical information and data for re-enactors or more general social historians. Late Tudor/Early Stuart (1580–1660 AD) Most of our books fall in this period, please use the topic section.